no shampoo? | Anna Allen Clothing Blog: no shampoo? My hair is thick and I've used lots of product before to try and bring my hair together so it's not so fluffy. I've used spray gels and they do seem to work okay, but they also make my floor a sticky mess if I don't wipe it up after every time I spray my hair. And the idea of putting gunk in my hair isn't very appealing. I love the fact that going without shampoo means you are going a more natural route and by doing this, you're not only eliminating nasty chemicals into your hair (and who knows what else is in that shampoo) but you're also helping out our environment. Going without shampoo would save me a little money. Maybe not a lot, but over time I think I would spend less money on shampoo and hair products so in a sense I am saving quite a bit of money down the road. Lately my hair has been really greasy and I think it's because I've been shampooing my hair daily. I decided either I need to cut back on my shampooing or just stop all together. Personally, I think cutting out shampoo altogether is just way more fun. Am I weird? Speaking of weird, the true reasoning behind all this is that I really just want to tell people I don't use shampoo. It makes me feel all hippie and natural. What can I say? I like that feeling. Yes, I like people thinking I'm crazy, weird, different or special. 'Cause I am! Okay, so these probably aren't great reasons to stop using shampoo, but I'm not really trying to convince anyone. I just want to do it myself. Also, I know my hair has a lot of curl to it, but right now it's so dead that it looks board straight. I want my curls back! And I think if I ditch the shampoo I might be able to get them back again without using a ton of hair product. I also want to start now while it's dry outside, because it's so much harder to get into the routine during the hot humid summer months. I want to get past that nasty greasy hair stage, which takes approximately two to three weeks. I think it took me two weeks the last time I did it, though. They say it may even take up to six weeks, so that's at least how long I'm going to stick with this. But I'm really hoping this works and I can stick with this no-shampoo thing for a long time. DON'T use any shampoo. You can use conditioner, you can use a mixture of baking soda and water or any other number of things. But no shampoo! Personally, I plan to cut out all shampoo and conditioner. I think I might even pass up the baking soda wash too. I want to see how it is with just water. Am I completely crazy? Maybe. But I'm still curious to find out what happens. Take a picture of the process. Start with day one and then a new picture every two weeks until six weeks have passed by. If you like it by the end of six weeks, you can continue another two weeks etc. I probably won't keep taking pictures if I do decide this is the way I want to go, but I thought it would be fun for at least the first six weeks. That's it! 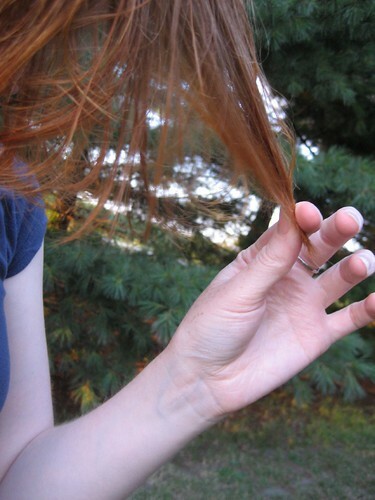 To get started, I'm listing some helpful links for the various ways of going shampoo-free. I plan to start a week from Monday, which would be February 16th (Presidents' Day). You can start that day or any other day. But I would love to know if you are doing this with me! If I get enough people interested in joining my little plan, I'll post a link to your blog (assuming you have a blog and are willing to blog about your no-shampoo experience) and I will list the date you plan to start. Just be sure to let me know when you plan to start. It is intriguing but the whole greasy six week period would also mean 6 weeks of my face most likely being broken out. I'm really not sure I can handle both my hair and my face being out of whack for 6 weeks. I would probably have to ween myself off of shampooing. Also, I would probably have to do the conditioner version because of my long hair. It gets horribly tangled without conditioner. I'm talking knots! It is definitely something to consider though!! It would save me so much time in the morning since washing this long hair seems to take forever. i wash my hair about once a week, in winter maybe every fifth day (because of the hats i'm wearing it's getting greasy faster). people usually think i'm nuts. also, i have started to only use nature cosmetics, so my shampoo (which i only use once a week) doesn't contain anything made of mineral oil and no silicon. i'm really happy this way so i won't join the challenge, but i support your idea frommy heart. oh, and i don't use any kind of conditioner or any other hairproducts.. I try to leave it as long as possible, but I have only managed to go about a week. It's not that my hair looks horrid by that time, but my scalp gets so itchy. I do like the idea of less chemicals though! Something to think about!! Anna, I can't wait to see how it works out for you! Not sure how I feel about it. I'll wait to see how it works before deciding to try it. :)Hehehe! Good luck! I kind of like the "no-poo", but I might have an immiture sense of humer. Anyway I'm in, though I can't promise how long it will last. I have always been taught to at least use conditioner because of the curls. But I think i will stop using everything, even my supper hold hair products. Though if my hair is supper frizzy, no one is allowed to laugh. I love your little blog....so refreshing! Can you tell me how to access your old playlist? I loved some of the artists and should have written them down.....but did not:0 Thanks for sharing all you do! Agreed on everything said here! I've been thinking a lot about this recently (again). I am going to slowly halt my 'poo consumption. I was down to once a week and it was the best thing ever for my hair! I'll start with every other day. Have you ever done a dry shampoo, with powder? Massage non-talc baby power into your scalp (I suggest Burts Bees baby bee) it smells so nice and gives great volume, and takes away the greasies. thelonghaircommunity.com has so much info on this type of hair care. I remember when I was working in the desert I went for a few months doing more than rinsing my hair. That's when it was pretty long too (for a guy). The combination of wind and sand actually kept it from being very greesy at all. Lately I've been doing it again, even though I'm not working in the field. My Army schedule doesn't leave a lot of time available in the morning, so all I do is rinse off my (admittedly very short) shock of hair. It works. Three months and counting. so tempting to try this - my hair is a fried mess! I tried doing this over the summer and gave up after a week (my hair & skin is ridiculously greasy to begin with, thanks mom & dad) when friends started asking me if I had just taken a shower---apparently my hair looked more wet & greasy than blonde. Gross. I did switch to a more natural shampoo and stopped washing my hair every day, which I think has helped a lot. But, perhaps I'll start cutting down to washing only two days a week and give Sarah's talc powder suggestion a try. I'm interested in this. Will let you know if I decide to play along on my blog. I would be doing the baking soda method if I do. As it is, I only shampoo about twice a week . . .
Just stumbled across you blog. First off its lovely. Anyway, just wanted to say, I'm with ya! Ok Anna this is too funny because a year ago I decided that people in the 18th and 19th century didn't wash their hair much and old ladies like my grandmas only did it once a week so I was going to stop with the every day thing. I felt like a greasy pig at first but the longer I went the longer I could go. So I did it gradually, each week increasing by a day or 2. I wear it up when it starts looking skanky (after 3 days)because I do have a professional job and need to look clean and groomed. I can wash it now every 4-5 days. But, the idea of no shampoo is intriguing. Perhaps we would get a sense of how people's hair looked before commercial shampoos were used.